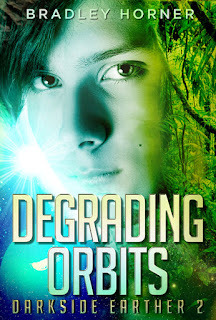 Bradley Horner's Book Reviews: Degrading Orbits on Amazon! The sequel to Darkside Earther is here! Where Axel is transformed into everything he hates. Forty-One thousand kilometers of jungle orbiting the Earth, the invasion of the encircling space station that holds it, and assassins! Alternatively, for a limited time, you can get a review copy here.